This Kitten was delighted to attend the 5th edition of TILTing perspectives (already announced here), which took place at the Tilburg University from 17 until 20 May 2017. Here is her report. The program was divided into different tracks, and this Kitten attended the IP sessions, which were truly engaging. 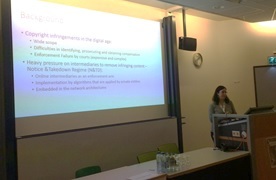 Dr. Sharon Bar-Ziv (Haifa Center for Law & Technology and Sapir Academic College) presented the outcomes of her research carried out with Prof. Niva Elkin-Koren, which focused on Israel and whose aim was to analyze the two current strategies for online copyright enforcement: through intermediaries (Notice and Takedown -N&TD-) and by courts. The goal was to identify who are the players, what kind of materials are removed, whether the enforcement proceedings comply with copyright law objectives, and whether they are effective. For such purposes, a random sample of 10,000 N&TD from May to October 2013, was taken (unfortunately, it was not made clear from where the sample was drawn) and then the N&TD were analyzed. As well, 273 lawsuits involving allegations of online infringement, filed in the Israeli courts between 2010 and 2013, were analyzed. Among the interesting outcomes, Dr. Bar-Ziv highlighted that in the digital arena, 66% of the complaints filed based on copyright infringement were not in fact related to infringement but rather dealt with censoring issues, such parody videos or bad reviews. She also remarked that private individuals filed most of the lawsuits against corporations for claims based on misuse of photographs. When software is at issue, large multinational companies (Microsoft followed by Adobe) top the list of sending out N&TD demands to local Israeli intermediaries, such as www.iatraf.co.il and www.dacho.co.il. Dr. Bar-Ziv noted that the high cost and prolonged length of litigation reduce the effectiveness of enforcement before the courts. To the contrary, the low cost and virtually instant remedies are the potentially positive side of enforcement through intermediaries. However, in fact, 85% of the cases examined, the link was still online, 8% of the cases did not receive a response or an error was received, 5% of the cases were taken down, and 2% of the cases yielded other responses. As a result, she concluded that the N&TD system requires further examination due to lack of transparency regarding the content removed. 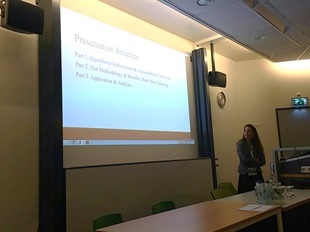 Dr. Maayan Perel (Haifa Center for Law & Technology and Netanya Academic College) presented the outcomes of her research also carried out with Prof. Niva Elkin-Koren and once again focused on Israel. The research had the aim of enhancing public scrutiny regarding online copyright enforcement by checking the algorithmic behavior used by the intermediaries. Considering that algorithms are often referred to as black boxes because their inner workings are mysterious due to their technical complexity, Dr. Perel applied the methodology of black box tinkering, which, in the words of Nicholas Diakopoulos, refers to a “process of articulating rigorous examination drawing on domain knowledge, observation, and deduction to unearth a model of how that system works” . A small sample of infringing and non-infringing content was uploaded to the platforms: a video in which the fair use defense applied, a non-infringing video, a video infringing only music, an infringing image, and infringing videos with and without Content ID. Thus, after uploading the content, an analysis took place regarding how the algorithm responded, especially whether it detected, blocked or removed automatically the infringing content, and, if not, whether a notice and takedown was submitted. Stay tuned for the second part of TILTing perspectives 2017! *Pictures are courtesy of Martin Husovec (@hutko).